Sometimes ranked the second-most popular sightseeing attraction of Vienna, sometimes referred to as the oldest zoo in the World, Tiergarten Schönbrunn is certainly up for superlatives. Whether or not they are deserved is a different question. The zoo was founded in the noble spirit of a Baroque interest in everything, particularly everything beautiful. When Empress Maria Theresia promoted the development of Schloss Schönbrunn Palace, her husband Karl of Lorraine also wanted a zoo to be part of the extensive parks surrounding the castle. And so the Tiergarten (literally "animal garden") Schönbrunn was founded in 1752. The habit of keeping big animals in enclosures for the recreational purposes of rich noblemen was a custom that had developed in the late Middle Ages and the Rennaisance - in fact, re-invented, as the Romans had been very keen on animal collections, too. Anyway, by the time that Tiergarten Schönbrunn was founded, there were already several similar institutions up and running in various places of Europe - however, one can argue whether they count as "zoos" for various reasons. One zoo that clearly was a zoo before Schönbrunn - as a biologist from Salzburg I just have to say it - is Tiergarten Hellbrunn just south of the city. 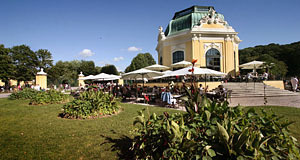 It was the Prince Archbishop′s leisure centre; however, it was closed for many years in the 19th century, and so Schönbrunn still holds the claim to be older in the category of "uninterrupted" zoos. Animal enclosures had been on the site of Schönbrunn since the 1570ies, by the way. Anyway, the zoo of Empress Maria Theresia and Karl of Lorraine consisted of a pavilion in which the Imperial Couple could have breakfast or coffee. A total of eight enclosures surrounded the pavilion like the pieces of a cake, thereby creating the impression to stand in the middle of a wild array of nature′s fiercest creatures. A very Baroque thrill, indeed. As early as in 1779, the zoo was opened to the general public and free of charge. Maria Theresia′s son, Emperor Joseph II (the emperor from the movie "Amadeus") inherited his parents′ interest in nature and financed expeditions to Africa and the Americas to catch new and exciting animals. Animal welfare was clearly not an objective of zoos back in those days. In 1826, the first giraffe was brought to Vienna and became the ultimate sensation of the year, influencing art, fashion and literature. Before World War I, the zoo had a collection of 700 species with 3500 individuals. Since WWI was a bit of a disaster for Austria, supplies soon ran short and feeding meat to animals was less of an option than feeding animals to people. By the end of the war (which coincided with the end of the Empire), the number of animals in the Tiergarten Schönbrunn had dropped to a mere 900. The zoo was now property of the Republic of Austria, which had more severe problems than taking care of the Emperor′s animal collection. Despite of a short recovery period in the inter-war-time, the Tiergarten was neglected in the following years. However, worse was to follow in World War II: During the "Battle of Vienna" in February 1945, the zoo was hit by bombs and many animals were killed. At the end of WWII, only 400 animals had survived in the zoo. In the following years, the zoo was renovated, but the managers in charge failed to modernise it. Continue with "Tiergarten Schönbrunn - Part II"